Boost your Dalek Attack Force with this Exterminate! expansion pack. 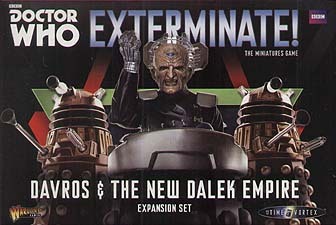 Davros & the New Dalek Empire features twelve easy-build plastic Dalek miniatures and an exclusive metal miniature of Davros, creator of the daleks. New Recruitment cards allow the player to add other iconic Dalek units to their faction such as the mysterious Cult of Skaro and the powerful warriors of the Emperor's Guard. Additional Dalek faction Adventure cards introduce Agents, Dalek Flight and even more effective ways of exterminating their opposition! Also included is assembly and painting advice for those who wish to make their Daleks even more authentic looking. These highly detailed plastic Dalek miniatures are 'push-fit' allowing them to be easily built without glue. Models supplied unassembled and unpainted. Paints and not included.